Casual clothing for kids, nice jackets and pants for a chilly climate, and $10 off coupon on apparel, shoes, and accessories for your $40 purchase or more. 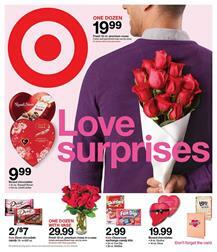 Target Weekly Ad clothing range also covers shoes like sneakers, boots, slippers, and accessories including jewelry. I also recommend you to see the outdoor furniture and household section of this ad. They have solutions to many household problems like cleaning and simple products are available in stocks. Check out pg 32-33 for the all-purpose cleaners, minimalistic understanding of household supplies. Be fancy and comfortable at the same time, with buying the apparels you find on pg 14-15. Renew your wardrobe for a low cost this week. Improve your home entertainment technology with low-cost ideas by Target. This ad shows the prices of 4K TVs, exclusive designs of some electronics, game consoles including Nintendo Switch, Bluetooth speakers and other sophisticated technology of what most people desire nowadays at their home.